This website aims to cover churches within the City of Birmingham and is set out by ancient parish. Parishes and deaneries have changed over the years since the Diocese of Birmingham was set up in 1905. 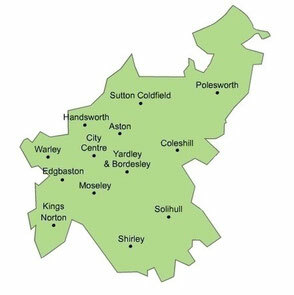 To find churches in the current arrangement, click the map to go to the Diocese of Birmingham website (from which this map is taken) - it links to the Anglican website A Church Near You. Some churches in the Diocese but outside the City of Birmingham are, with some exceptions, covered in this section. These include churches in the deaneries of Polesworth, Shirley, Solihull, Warley, and the rural churches in the Deanery of Coleshill. and the list is incomplete!